Khyber Pakhtunkhwa Wildlife Department Dera Ismail Khan. At least 2nd class Intermediate Certificate from a recognized Board and two years Veterinary Assistant Training Certificate from a recognized Agriculture Training Institute or any other recognized Institute. (a) At least 2nd class Intermediate Certificate with Matric Science (2nd Division) from a recognized Board. iii. Eye-sight: V-63 (with glasses), each eye 6x6. Note: It is essential that the candidate will have to qualify Marathon race of 2-Km within 20 minutes. 1. 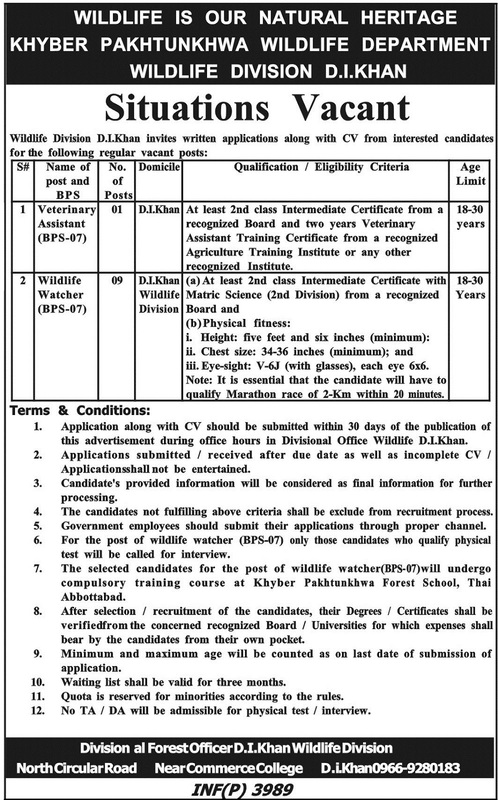 Application along with CV should be submitted within 30 days of the publication of this advertisement during office hours in Divisional Office Wildlife D.I.Khan. 2. Applications submitted/received after the due date as well as incomplete CV / Applications shall not be entertained. 3. Candidate's provided information will be considered as final information for further processing. 4. The candidates not fulfilling the above criteria shall be excluded from the recruitment process. 5. Government employees should submit their applications through proper channel. 6. For the post of wildlife watcher (BPS-07) only those candidates who qualify physical test will be called for interview. 7. The selected candidates for the post of wildlife watcher (BPS-07) will undergo a compulsory training course at Khyber Pakhtunkhwa Forest School, Thai Abbottabad. 8. After the selection/recruitment of the candidates, their Degrees / Certificates shall be verified from the concerned recognized Board / Universities for which expenses shall bear by the candidates from their own pocket. 9. Minimum and maximum age will be counted as on the last date of submission of application. 10. Waiting list shall be valid for three months. 11. The quota is reserved for minorities according to the rules. 12. No TA / DA will be admissible for physical test/interview. North Circular Road, Near Commerce College, D.I.Khan.